Welcome to Dr Frank C Bemis & Associates! 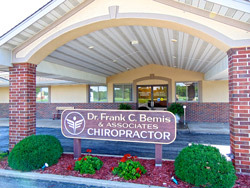 Dr. Frank C. Bemis started practicing in 1966. Dr Frank C Bemis & Associates opened nearly three decades ago, offering drug-free, natural chiropractic care to those living in Alton, Godfrey and the River Bend area of the Mississippi. Our knowledgeable team of chiropractors is ready to evaluate your spinal health and eliminate subluxations to fulfill your greatest health potential. Our chiropractic care is family-based. We treat a range of ages, from infants to those in their nineties. We even have a club for our patients in their nineties to celebrate their continued health. The variety of techniques we use are suitable for many different conditions that patients seek our help with. These techniques include both manual and instrument-based adjusting and are gentle and specific. As the largest chiropractic practice in our community, our intention is to grow by building professional and community alliances by supplying personal and progressive health care to responsible, enthusiastic, health-oriented families in a positive, efficient and compassionate manner. By involving our patients through education, we intend to supply total health care for the whole person to reposition them from pain to wellness, which will create a better quality of life now and in the future. Our aim is to provide personal and financial fulfillment to our committed staff, who will continue to grow in knowledge and achieve a higher level of consciousness. We seek patients who will actively do their part in educating and referring others to create a healthier world. We’re ready to evaluate your health and make a plan tailored to your needs. Call us today to start!